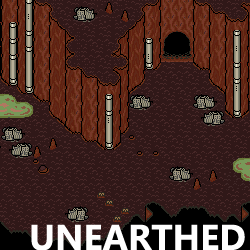 Unearthed is an Earthbound hack in progress, with an estimated release date of late 2011 or early 2012. Unearthed will feature a completely original plot, a new cast of characters and a distinctive world map with entirely new zones. Although different from Earthbound it many ways, it will still utilize many of the same core gameplay mechanics.